OK, after a satisfying Swords & Wizardry interlude, let’s get back to our schedule. At my last post I (sort of) concluded that the various d20 games are entertaining (for me) approximately until the 10th level. Now it’s time to come up with some suggestions about how to deal with that. It’s a paradox: I want my games to “end” at levels 10-12, but I don’t want character advancement to stop. My problem may reside with the nature of the character progression and how the game sets certain challenges to levels. Oh, and just a small conceptual clarification: when I say “d20 games” I mean D&D 3rd and its offspring (AD&D 2nd and everything before, including 99% of most retroclones, are off). Also: new rules at this post are geared toward Pathfinder. As I said, I’m not interested in running games – mechanically speaking – beyond the 10-15th levels. In fact, at my table the adventures become considerably over the top already by 10th level. You can’t go much further without changing the nature of the game itself (or “Dragonballing it” as I like to call it). If I introduced epic elements (20th+) after the 10th level – thematically speaking – my players would quickly accept them. My last session of Curse of the Crimson Throne, in which I set the player characters against a stone giant army, showed exactly that. It also confirmed that – in my groups’ mindset – “epic” challenges should be stuff around 15th level at most. I firmly believe that you could place demon lords, archdevils, demigods and other “epic” threats as 15-20 CR creatures without any problem (that is one of the reasons why I love the D&D 3.5 Fiendish Codex series). Deities and things of that scale – if I stated any of them – would probably be at most at CR 30. Given the power boost of 3rd/Pathfinder it also makes sense for me to place the most powerful NPCs of most settings around 9-12th level. It works, it’s not mechanically cumbersome (for me at least, after all, YMMV) and it fits with how my table “sees” the various campaigns settings. Finally, I feel that the d20 system would work better if most base bonus stopped around +10. I remember reading somewhere that Gygax and Anderson planned the original game around such level cap (however, one can also argue that high-level is VERY differently in the first editions). There is a point where most bonus progressions become just “big numbers” without any impact at the table. Sure, you can increase the monster’s and threat’s numbers (hello, D&D 4E), but the end result is the same: “bigger numbers”, without any (dramatic or dynamic) impact at how the table group feels the game experience. The first inspiration for “interrupting” the game’s progression, already mentioned a lot in this blog, is the awesome E6 mini game, which I used to make my E12 game. Another major inspiration was the original “epic system” for D&D 3rd, designed by the luminary Jonathan Tweet, which I still believe to be the best (but not only) option for d20. I want to try something different here. I’m not supplying a new subsystem, just loose ideas. My goal is to offer alternative mechanics in order to replace simple arithmetical progression of BAB, Hit Points, Skill Ranks and Saves. I suggest using these alternatives after 10th level, but maybe they could be applied at other points (like 6th, 8th, 15th or even 20th level). After reaching 10th level, the BAB, HPs, save and skill rank progressions would stop (class feature would go on). Instead of them, you would have the following options. Please, note that I don’t take in account multiclass rules. I’m not sure how they would work with the ideas bellows. For now, consider that acquiring a new class is forbidden after 10th level. If your new level would grant a +1 to your BAB, choose instead one of the benefits described below. Attack Dice: choose one weapon. You gain a d6 with this weapon. This die can be added as bonus to your attack or damage roll, or to execute one additional attack of opportunity. You can buy this benefit multiple times. If used on the damage, the d6s explode (i.e. are open-ended rolls). Improve secondary attacks: a +1 bonus to all your secondary attacks. You can take this benefit multiple times, until your secondary attacks reach your fist attack bonus. Rerolls: reroll one failed attack roll per combat. You can buy this benefit multiple times. Critical : choose one; gain a free attack after confirming a critical hit with it. You can buy this benefit multiple times. Combat Reaction: as an immediate action, add ½ your BAB to your AC vs one attack. Can be used once per round, after the enemy attack roll, but before the GM narrates the results. This is the easiest part. I don’t want HPs skyrocketing, so all Hit Points gained after 10th level become Reserve Points. You still gain HD for the purpose of spells and effects (like the various power word spells). I also recommend that you create some “Second Breath” mechanic. Something that allows a PC to use his Reserve Pool once per day, as a full-action. Also easy “to fix”. At every odd level, choose a benefit from below. Automatic success: you can a free success once per game session. This benefit can only be used with your ‘Good’ save progressions. You can buy this benefit multiple times (maximum 3). Improve weak saves: add +1 to one of your ‘Weak’ save progressions. You can buy this benefit twice for each ‘Weak’ save throw. Luck of Heroes: you gain a d4 bonus die to save throws. Once per day you can add this d4 to any save throw. You can buy this benefit multiples times. You must choose to use the bonus dice before rolling the save. OK, this is the hardest bit and will require a lot of GM’s call to work. Let’s try. First rule: you can’t have more than 10 ranks in any skill. Second rule: after 10th level, rank costs are doubled (i.e. 1 rank costs 2 skill points). Instead of buying skill ranks, you can buy one of the benefits below. The first time you buy a specific benefit, it costs 1 skill point; the second time 3 points, then 5, 7 etc. Given these costs, you may desire to accumulate skill points, instead of spending them at each level. 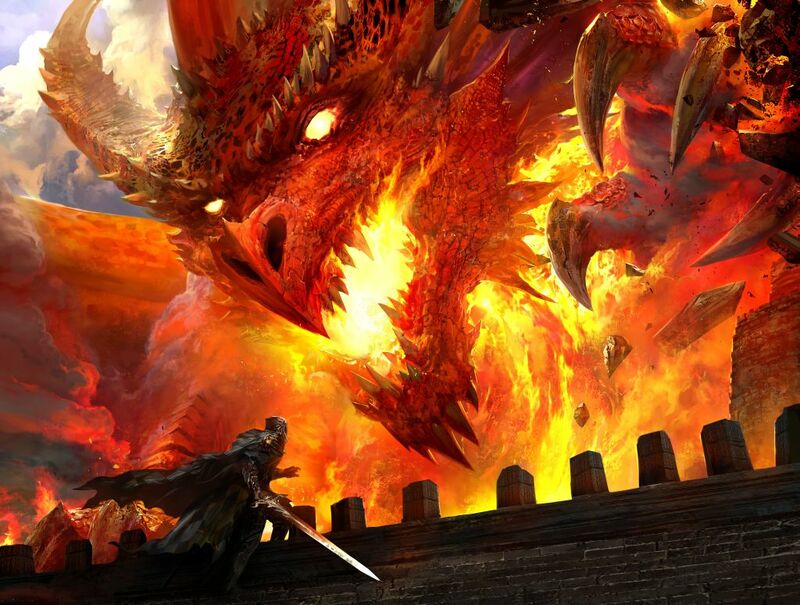 Skill Specialization: choose one specific kind of task within a trained class skill (for example, ‘Dragons’ for Knowledge [Arcane] or ‘Darklands’ for Survival). You gain a d6 bonus die for this specialization. You can choose new specialization for the same skill or for others. Reroll: reroll a failed skill check once per day. You can buy this benefit multiple times (maximum 5). Critical Success: you gain a special benefit if you roll a natural ‘20’ with one specific trained class skill. This requires a good deal of GM ad hoc calls. For example, a Critical Climb check could remove all penalties for climbing. A Critical Diplomacy could turn the NPC into a follower etc. Skill Trick: this was an idea from the Complete Scoundrel sourcebook (D&D 3.5). Basically, you gain a small mechanical benefit with a specific skill. Things like reduce time to use a skill (using Diplomacy as full-round action), correlated abilities (standing up as an immediate action for Acrobatics; or detect magic with Appraise). Check the original Skill Trick to better customize the benefit, remembering that tricks in general were considered “half-feats” in strength (very specific things, useful, but not powerful). They also were usable just once per encounter (or minute). Recover Dweomer: if a spell cast by you is dispelled, negated by SR or completely negated by a successful save throw, you recover the dweomer. This benefit can’t bought 2 times in a row. Metamagic Pool: you gain 1 metamagic pool point. You can use it to pay for the increased spell slot cost of using a metamagic feat. This benefit can’t bought 2 times in a row. Master Slot: you gain a spell slot of any level, except your highest. The third time you buy this benefit, you can instead choose your highest spell level. The fifth time you can choose a spell level above your highest. Finally, the normal class features. I wouldn’t stop their progression, although I do recommend that the GM check each case, as some class can either become too strong (or weak) with the rules above. Actually, if this entire subsystem seems broke you can just use the E6 mini game or Tweets’ Epic system instead, as I mentioned at the beginning of the post. I hope that maybe some of the suggestions described here can be become, at least, new E6 feats or epic benefits. In fact, the entire idea of this post is just to toss out some of the craziest stuff that I’ve been thinking lately. Here’s my second Swords & Wizardry class. I didn’t finish in time for the S&W Appreciation Day, but here it goes! This is my shot at a classical Sword & Sorcery magician. It’s also an attempt at creating an easier spellcaster (for those that are intimated or just don’t like of the vancian system). Credit must be given where it’s due. The design madness (and, I hope, playable class) below was inspired by the awesome Carcosa supplement, an idea tossed by RPGPundit and great rules tinkered by Talysman, from The Nine and Thirty Kindgoms blog. Sorcerers use the same attack matrix, XP, Hit Dice and saving throw as the Monk. They can use the same weapons of a Thief, but no armor. They can magic swords and daggers, rings, potions, scrolls and most miscellaneous magic items usable by Wizards and Thieves. Sorcerers can see in the dark for 60 ft. They can also summon natural shadows to hide them. This works like the Hide in Shadows ability of a Thief equal level, except that, if it works, the Sorcerer is literally invisible. However, he can’t move or the dweomer is broken. 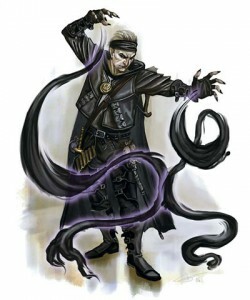 Eldritch blasts: At 1st level a Sorcerer can execute magic ranged attack at will that deal the same damage as a weaponless Monk of the same level. The Sorcerer must define the nature of his blast with the Referee (fire, electricity, otherworldly flames, howling souls etc.). If the Referee allows it, the chosen blast can have secondary small effects (like setting things on fire or freezing stuff), usually without major impacts in combat (except for the creative Sorcerer). The Referee can also allow a Sorcerer to quest for different types of blasts, by contacting extraplanar entities or making pacts with powerful creatures like dragons. Arcane shield: A 1st level Sorcerer can protect himself with a magic barrier. The Sorcerer gains the AC of a Monk of equal level. Once activated it lasts for one combat. The Sorcerer must sacrifice blood to activate this protection (1 hit point per Sorcerer level*). This nature of this protection must be defined by the player and Referee, using the same guidelines above. *Anytime blood is required, it may come from the Sorcerer himself or by killing a defenseless creature with a melee weapon (like a dagger). Language of Beasts: A 4th level Sorcerer can speak with animals. He can also offer his blood to a small animal, creating a familiar. A familiar is an arcane servant that will obey all the Sorcerer’s commands and can deliver touch spells. The Sorcerer can concentrate to see and hear through the eyes of his servant (during these trances the Sorcerer is defenseless and blind to his surroundings). At 7th level, a Sorcerer can assume the shape of his familiar once per day, by shedding 4 hit points of damage. A Sorcerer can banish his Familiar by spilling his blood before the servant. If an arcane servant is killed, the Sorcerer must save or be reduced to only 1d6 hit points and lose his power for one day. If a rival spellcaster seizes the familiar, the Sorcerer suffers a -4 penalty on saves against him. Somatic Mastery: A 5th level a Sorcerer has total control over lesser body functions through mystic trances. While meditating the Sorcerer gains the same benefits of sleep and rest, but it’s still aware of his surroundings. He can also enter a deeper trance, hibernating for as long as he wishes. While hibernating the Sorcerer appears to be dead and doesn’t require food, water or air. Levitate: Beginning at 6th level a Sorcerer can slowly levitate through short distances (20 ft.). At 8th level its 40ft. Finally, at 11th level, its 100 ft. Each use requires 4 hits points of blood. Will: Beginning at 7th level a Sorcerer can hypnotize any humanoid creature (anything from a halfling to an ogre). This requires 1 round of direct eye contact and works like charm person (the target can save). Only three targets can be kept hypnotized at the same time. Bind: A 8th level Sorcerer facing an extraplanar creature may attempt to bind it to his will. Treat this as a special reaction roll – 2d6 + double (Sorcerer’s level - opposing HD rating). On a 9+ the creature is binding and must obey three orders from the Sorcerer. After the first order is fulfilled, the outsider gains a saving throw against each other order (the Referee can also grant a free save against the 1st command if he thinks the Sorcerer is twisting this rules of binding). Binding requires that a number of hit points of blood equal to double the outsider’s HD (this value is a secret, the Sorcerer only discover this AFTER rolling the binding). A failed binding can’t be attempted against the same creature (unless the Sorcerer uses a ritual or gains some advantage, like learning the being’s True Name). Curse: A 9th level a Sorcerer can cast a curse on any creature responsible for bringing him below 6 hit points. This curse must be approved by the Referee, but Table 88 at page 122 of the Complete Rulebook is a good guideline (you could even roll on it). Uttering a curse inflicts 1d6 points of damage on the Sorcerer. Astral Journey: A 11th level Sorcerer can enter a deep trance, leaving his body, either to journey to strange otherworlds (like contact other plane, except that all insanity chances are increased by +5%) or to visit other locations of this world (like astral spell, except that the Sorcerer can’t cast spells or intervene in astral form). After using this power a Sorcerer is weakened for the next 1d4 days, losing access to all his class abilities (except his dark vision and language of the beasts). Doom: A 14th level Sorcerer can, at dusk, utter how he’ll meet his doom. He must choose a form of death: pierced by a blade, drowned, burned, smashed by a beast etc. (these are just guidelines as the category can’t be too generic or specific). If the Sorcerer is killed in such fashion in the next 7 days, he’ll come back from the grave in the new moon, his body fully reconstructed at the closest and safest location of his original demise. Each time a Sorcerer come back he acquires an inhuman tell or trait (brimstone smell, scaled patches of skin, a tail, cat’s eyes etc.). Ritual Caster: Sorcerer can search for and cast rituals, as determined by the Referee. Use those described in Carcosa or Call of Cthulhu as examples. Sorcerers must be of Chaotic alignment. They must also choose a Patron and fulfill a quest for his master each time he gains level. Failure incurs at curses, attacks from otherworld entities and worst things. A Referee is also invited to come up with eldritch taints for Sorcerers that disobey or constantly change Patrons (see ideas here). S&W was my first retroclone and is still my favorite one, responsible for bringing me to the OSR and – more important – for opening my eyes to older games. RPGs that I, erroneously, believe to be outdated. In regard to S&W, the genie is definitely still in the bottle – especially the wonderful S&W White Box. Here is a new class for S&W – the Barbarian. If you liked it I also made other two classes for OD&D – the Yogi and the Mastermind. I’m also tinkering with an entry-level class for spellcaster – something that doesn’t use the vancian system. I’ll post it here maybe in this week. My take on the Barbarian tries to move away from the traditional d20 version. His niche are resiliency and survival, not rage and of hit points. I’m not sure how far I was successful with those. Barbarians use the same attack matrix as Fighters, Paladins and Rangers. They have the same saving throw and Hit Dice as Fighters and require the same amount of XP to level as Rangers. Barbarians are driven by instinct and animal reflexes, reacting to things before most civilized people know what’s happening. Parties containing a barbarian are only surprised on a 1 in 6 chance and have a +1 bonus to initiative checks (multiple barbarians in the group don’t increase this bonus). If a barbarian fails a save against a fear effect, he can instead choose to go berserker. While in this state, he must attack an enemy each round through melee combat. He gains a +2 bonus to attack and damage rolls. If no enemy is in sight, he must strike an ally. Each time he hits an ally, the barbarian can attempt a save to stop the rage. After raging, he suffers a -2 penalty to all rolls for the next 1d6 hours. 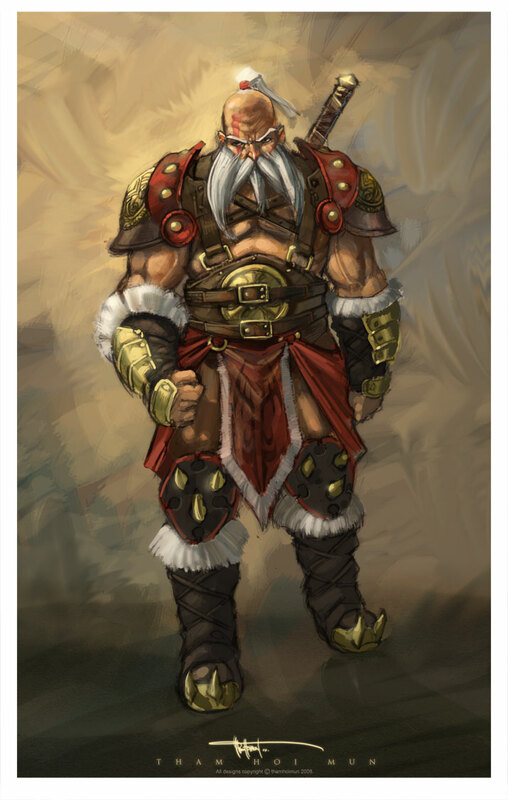 At 3rd level, a barbarian can choose to rage after failing any charm of dominating effect. At 7th level, a barbarian can choose to rage after being reduced to ¼ of his total hit points. Barbarians are though and resilient. They can go without food, water and rest for three times longer than other characters. They can also hold their breaths trice the normal time. They can also forage successfully for food and water for themselves and five other characters. Barbarians are reinvigorated by blood and slaughter. After felling an adversary with a natural 20 or killing the strongest enemy around (monster with more HD and biggest size) a barbarian can either execute a free attack or recover 1HD of hit points. This ability can only be used once per day. At 4th level, a barbarian is capable of keep fighting even after suffering grievous wounds. If brought to 0 or less hit points, he is allowed a save. If successful, he doesn’t fall dead or unconscious, but roll a 1d4. This is how many hit point he has left. This ability can only be used once per day. At 8th level, a barbarian gains preternatural reflexes and inhuman vigor. If he succeeds at a save, he doesn’t suffer any damage from effects that deal half damage like fireballs. He also can reroll saving throws against poisons and death magic, if the first roll was a failure. At 9th level a barbarian becomes a barbarian chief and can either built a holdfast in the wilderness or gather a band of raiders. A holdfast will attract followers from the barbarian’s clan, tribe or kin. He must keep the hold free from outside interference. If the barbarian gather a band of (usually mounted or sea) raiders, he’ll attract only ½ the usual numbers of followers. The barbarian chief can’t stay more than a month in the same place (or hex), but can wander freely through the same region, for as long as there’s loot. Barbarians distrust most forms of magic, especially arcane. They can only use magic weapons, armors and potions. Can’t use “foreign” weapons and armors. Can’t allow spells to be cast on him. Can’t accept or ask for help. Must always honor his word. A barbarian that breaks his taboo, lose access to the class abilities described above (except foraging) for the next days (at maximum a week) because his inner resolve is shattered. The referee can allow a barbarian to redeem himself before that if the character gets in a dire fight (i.e. either is brought to 0 or less hit points or slays a number of HD equal to triple his level – alone). Barbarians can’t be of Lawful alignment. Usually only humans come from barbarian cultures. A barbarian can choose to shatter his weapon after hitting an enemy. The attack deals maximum damage. He can only use this ability once per day. Think on this like an inverted “shields shall be shattered!” rule. I’d like to share my experience with higher-level campaigns. I started GMing at 1994 and the main appeal of RPGs for me were the idea of campaigns – years long games with elaborate tales, changing and evolving PCs etc. I remember that, at the time, I managed a 3-4 years AD&D 2nd campaign and a 2 years Vampire the Masquerade game. None were properly a campaign in that neither had a main goal, story or purpose – they’re just a bunch of wacky adventures around the same group of PCs (yes, even the Vampire one… please note that I was teen GM). The last year of my AD&D 2nd game started to resemble a campaign in the modern sense, with an overall arch and a final goal – ironically, exactly at this time D&D 3rd came out and I canceled the game (one of my deepest regrets). My original AD&D group never migrated to the “d20 era” and I had to start from scratch. My first D&D 3rd campaign was in Greyhawk. I started it in 2001 with the Sunless Citadel and the Forge of Fury, followed by Return to the Temple of Elemental Evil. 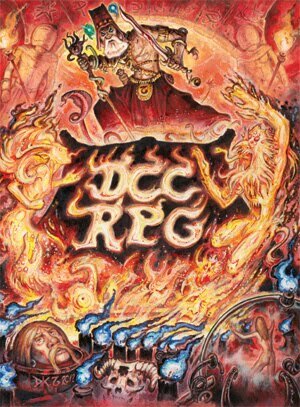 The funny thing was that, at the time, I was just following the hype – I didn’t really liked “dungeon crawl” as a genre. However, the games were definitely fun. When the party reached 10th level things started to get out of hand for me – too many magic items, complicated monsters, various crazy prestige class abilities and, above all, lots of overpowered spellcasters. High-level combat in 3rd Edition was dominated by “absolute” effects: mainly save-vs-die spells, but also lots of attacks that completely ignored AC or drained lethal huge amounts of levels (or ability scores) without save; and I won’t even mention the absurd DCs for spells and effects (it was relatively easy to have spells DCs of 26-30). The main culprits were the magic and psionic systems. Nonspellcasters didn’t have a chance, although they’re quiet resilient when in pure melee combat (except rogues). In fact, a combat between high-level noncasters could drag for quite a few rounds. Haste and buffs dominated the battlefield. Combats were in general mutually destructive, with initiative determining who was standing after a few rounds (interestingly how the same thing happened before, in my AD&D 2nd games that used the Player’s Options books). The Greyhawk campaign lasted 2-3 years – my longest d20 game so far. After that I most of the time only run Legend of the Five Rings; besides short games (3-4 sessions) like Lord of the Rings (CODA System), Exalted and Call of Cthulhu. I did tried coming back to d20, but all my attempts were short-lived (Black Company, Arcana Evolved etc.). I came into Pathfinder while running my Chronicles of the 7th Moon campaign (we started at D&D 3.5 and converted to Pathfinder approximately at 5th level). This became my second longest d20 campaign, with 4 years of intense gaming. Because we’re using a setting for which I co-authored, I felt free to indulge myself with house rules and different types of adventures. The campaign was a success among my players and reached 12th level. At this time, each character had so much stuff going on his sheet, that I stopped level progression (more info here). 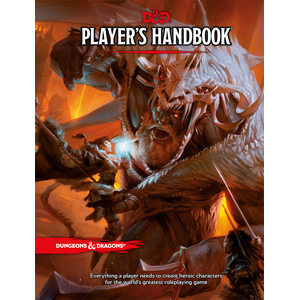 Actually, I don’t think this campaign is a good example of how Pathfinder works – I changed too much stuff (some of my house rules can be found here). Characters had extra Hit Points and were considerable stronger than their respective level (their power level was probably be closer to 15th level). So, finally, after a 1 year hiatus, I started the Curse of the Crimson Throne (or CotCT) campaign that I’m still running once every 20-30 days. It’s based on the 2nd Adventure Path made by Paizo and by far my favorite one (though originally written for D&D 3.5). I’m running CotC keeping to the Pathfinder Core Rulebook as faithful as possible. I’m allowing almost anything from the Advanced Player’s Guide, Ultimate Combat and Ultimate Magic. I’m also using Hero Points from the Advanced Player’s Guide, mainly as a substitute for raised dead and resurrection magic in general (removed as requested by my players). So, how does Pathfinder runs? First thing I noted: the core classes are wonderful and so robust that most players don’t even think about prestige classes anymore. This leaves the game more “clean” or “iconic”. The nonspellcaster classes gained a lot of punch. Spellcaster still rule the day, especially when you have few encounter between rests. In dungeon crawls (or adventures with a continuous sequence of encounters), nonspellcasters become an essential part of the group, keeping spellcasters alive. The spells’ DCs are also more controllable, especially given the lack of feat and prestige classes to boost them (this was already a trend by D&D 3.5). Spells are used to “soft” your enemies, so that Fighters and other nonspellcasters can zoom it to finish them. There is also practically no “absolute” spell anymore (another design choice that started with D&D 3.5, but which Pathfinder improved). Now the part that surprised me: damage escalation for noncasters. When the party reached 9th level I begin to note that classes like Fighter and Barbarian kept increasing their damage per round ratings – dramatically. Usually, at this point in D&D, you damage only gets higher through magic items. However, in Pathfinder, the various class features keep increasing through middle and high-levels. By the 12th level, the Fighter and Barbarian are dealing amazing amounts of damage each round (easily more than the casters after an entire encounter). Mixed classes, like the Magus, can go “nova” and skyrocket damages per strike ratings. The net result is that most of my battles are fast, almost as fast as those of the first levels. Oddly, I find this very good. The game runs less chaotically than D&D 3rd/3.5. However, the high numbers are starting to scare me. And, on the GM side of the screen, creating monsters and challenges for high-level play still require too much work and spare time for my liking. Given my absolute lack of the later, I'm in the habit of just reskinning most creatures and using pieces of other Adventure Paths and adventures. Features like the one above only strength my desire of “stopping” D&D 3rd/Pathfinder around level 10th and making 11+ campaigns as the “epic levels”. In fact, I’m only keeping CotCT rules as written because Paizo did already most of the heavy stuff for me (and also because we’re all having tons of fun). I’ll try to elaborate on some of my crazier alternatives for “advancement” in the next post.